I’ll put my biases right up front so you can decide whether to trust me or not: It’s entirely possible I’ve become Michael Rekevics’s unofficial PR man. I’ve reviewed a lot of his projects (and there are many), including Yellow Eyes and Vilkacis, and I’ve certainly enjoyed his work in Fell Voices and Vorde. I’ve also had the opportunity to see him play with at least three of the bands he performs in or masterminds, and I’ve been consistently blown away by his overwhelming intensity, regardless of whether he’s drumming, playing bass, or singing. I’ve probably used some version of this simile before, but it’s like watching a nuclear bomb detonate in musical form. Rekevics himself said that his influences are “simply powerful, evocative, melodically bold, and honest black metal. No posturing, no irony, just ancient power and timeless force.” And he lives his unique take on those influences on stage. 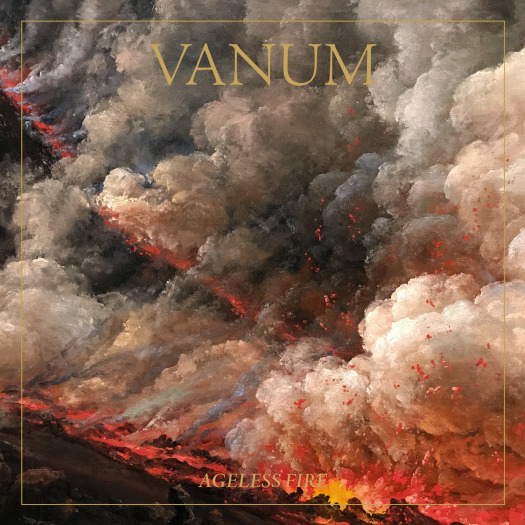 Vanum as a recording band has been Rekevics and Kyle Morgan, but on their latest, Ageless Fire, they’ve brought their two long-time live members, E. Priesner and L. Sheppard, into the band in a more official capacity. The resulting evolution has made for a Vanum album that meets your expectations--sweeping USBM with walls of sound--while expanding their sound from their previous full-length, Realm of Sacrifice. Realm of Sacrifice is, to my ears, a darker record, and although Ageless Fire is by no means “the softer side of Vanum,” there’s a stronger musical sense of power and triumph. There’s a striking moment in “Under the Banner of Death” when Rekevics, in his trademark, mid-range growl, proclaims, “Under the banner of death / I am alive / I declare my being / in the language of fire.” I’m not going to all lit-crit and dissect the meaning of this, but it’s hard to deny as a fist-raised, screaming-from-the-mountain-tops moment. The album as a whole is bit tricky to tease apart. Each song tends to showcase all or most of the band’s signature sounds, making a track-by-track rundown kind of pointless. Sometimes you let the “sheets of sound” (as John Coltrane’s music was once described) wash over you, and other times you dig in with a more singular, straightforward riff. One aspect I particularly enjoy is the twin guitar work that the album returns to again and again. Lines harmonize, and sometimes offer a bit of counterpoint. Sometimes they’re isolated in the quiet, and sometimes they ride on top of the waves. So have I further sunk into Rekevics fanboyism? Yeah, probably. Fight me. Sure, I suppose there’s always a chance he’ll ultimately spread himself too thin and start repeating himself, but it hasn’t happened yet, and I’m still in. 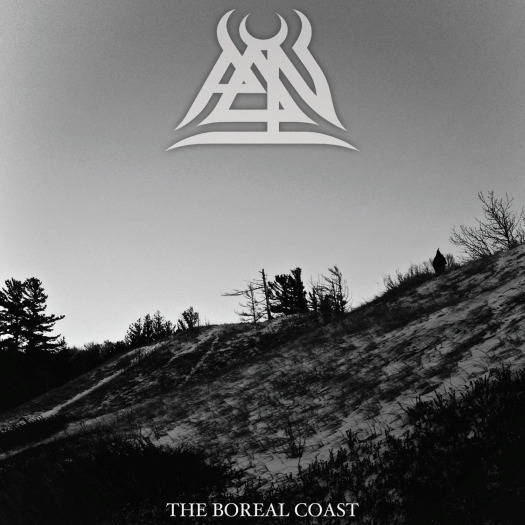 The Boreal Coast is an album of contradictions. The intro track, “Eventide”, sets the tone with a stomping metal riff that abruptly turns acoustic to finish out the 1:46 run time. Throughout the album Pan mix extremely groovy death metal riffs reminiscent of Temple of Void with whiplash tempo changes, angular sections, softer acoustic passages, and the odd guitar solo. It feels barely contained in it’s sub-forty minute run time. Though Metal Archives lists them as “progressive doom/stoner metal” Pan are much more rooted in death metal. Vocals are mostly a staccato growl, riffs tend to be angular and much of the album shows a Meshuggah-like obsession with rhythm above all. Progressive is certainly accurate, though. The album practically explodes with ideas. Grooves and riffs fly by, turning on a dime and all manner of clean and rasped vocals supplement the death growls. Interestingly, though, the show-stopper is when they completely change gears in the largely acoustic “Litany Nocturnal”; an ominous western-tinged track with appropriately sinister clean vocals. Throughout the album the grooves are killer and the whole band delivers, but the frenetic shifts are a double-edged sword. On tracks like “The Apothecary” all the riffs and transitions lock together for a roller coaster of a track. But, because the core of Pan’s sound is angular and highly rhythmic, anything less than an expertly executed transition really stands out. The flow sometimes seems stilted with section changes that sound abrupt or unnatural. That being said, some of these transitions sound smoother on repeated listens, after acclimatizing to the band's sound. It’s by no means a deal breaker, though. The band set a high bar for themselves and sometimes don’t reach it and it keeps a good album from greatness. In a crowded death, doom, and stoner metal space, Pan do things a bit different, and should be celebrated. Adventurous headbangers, don't miss out on The Boreal Coast. By Justin C. Before we get to the band Enon Chapel, we’ll take a quick history lesson of Enon Chapel, the church built in 1823 in London. The chapel’s Reverend Howse allegedly offered cheap burials, but then stacked bodies like firewood in a vault underneath the chapel itself. Before we get to the band Enon Chapel, we’ll take a quick history lesson of Enon Chapel, the church built in 1823 in London. The chapel’s Reverend Howse allegedly offered cheap burials, but then stacked bodies like firewood in a vault underneath the chapel itself. After discovering this very-unwise burial arrangement, the bodies were eventually removed and buried in a mass grave, and the resulting scandal--plus a population surge that was filling cemeteries to bursting--helped prompt several Burial Acts to be passed, banning further burials inside the city of London. You can imagine that the bereaved who thought they were giving their loved ones a proper, Christian burial were not pleased with what was discovered. 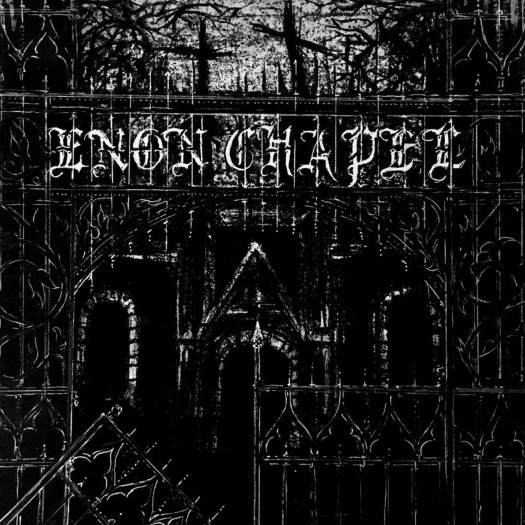 So Enon Chapel the band--funeral doom, right? Nope. This is a 27-minute blast of black punk/thrash, a side project of a site favorite, Balan (the man behind Palace of Worms and a collaborator in Botanist), and Meghan Wood (Crown of Asteria, Iarnvidgur). Wood provided the lyrics, vocals, and most of the guitar solos for the project, and Balan handled the rest of the instrumental duties. The sound could be superficially described as lo-fi black metal, but it strikes a balance between grit and quality recording. As you might expect, the album opens with some church bells, chants, and eerie, echoing guitar, but the duo doesn’t overplay the atmospherics--they have some more serious ripping to do. The songs, although generally short, pack in plenty of tempo changes and contain an excellent mix of black metal vocal styles, tremolos, and good-old, syncopated thrash riffs. I don’t usually get excited about projects labeled as black thrash, but this one dances effortlessly between the two genres, as well as a host of other influences, while still keeping a foot firmly in the realm of barn-burning metal. The guitar solos are also worthy of note. Unlike so much forgettable weedly-deedly nonsense, they’re melodic and ferocious at the same time, and they clearly belong to the songs they’re in, rather than simply being an interruption for showing off. This EP was a happy surprise for me, and although another lo-fi black metal project about corpses could easily be overlooked, I hope people find this and enjoy it as much as I did. It may not be a revolution, but Balan and Wood absolutely nail they style they’re working in.